AddictiveSynth now supports iOS7 Inter-App Audio. Not much else to say here. Sure is good news though as IAA begins to make a big impact on how we record. IAA supports 32bit floating point. That’s opposed to Audiobus and AudioCopy/Paste operating at 16bits. 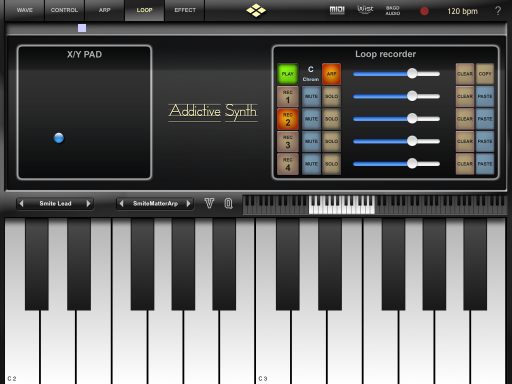 AddictiveSynth is still one of my most favored “goto” synth apps. If you don’t have it yet, read on and then go buy it. It’s a true “Must Have”! 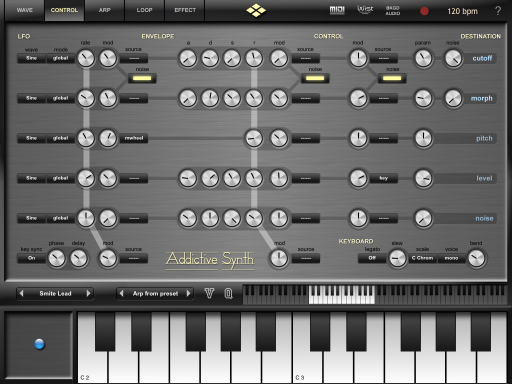 Addictive Synth arrived last year at a time when cool, new iOS synths seemed to be coming out every other day. Good ones too! 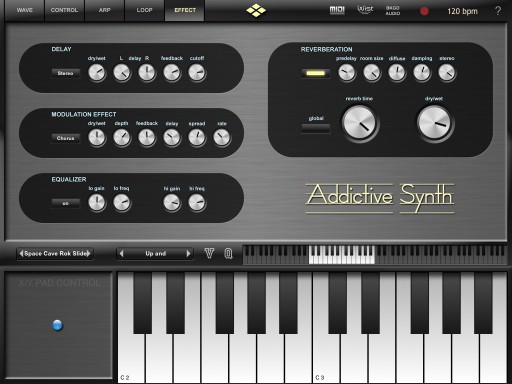 Addictive Synth however is a very big, hugely capable, soft synth, relatively speaking. It’s loaded with features, and programming possibilities. It immediately became a favorite of mine, and that hasn’t changed. Recently 2.0 was released with some new functions, and in my opinion the most noteworthy is the high quality reverb. Also added to this latest version is a spectral noise generator with dynamic filter structure. Additionally, 32 new presets have been added, most showing off the newest FX. More MIDI options round out the update. 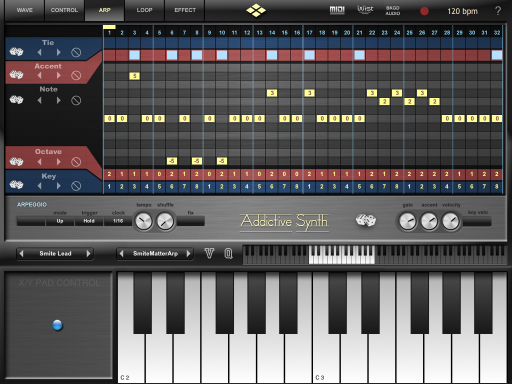 First, what is Addictive Synth? Besides down right amazing, it’s a dynamic wavetable synthesizer with 8 monophonic and polyphonic voices and 6 wavetable oscillators per voice. 4 LFO and 4 Envelope modulators, 128 programmable overtones capable of editing in real time. 3 FX can be run simultaneously. Addictive Synth is no slouch when it comes to FX, with a swirly Chorus, Phaser, Stereo cross delay, a simple hi/lo frequency EQ, Flanger, and now Noise, and a really nice spacious Reverb! Finding a decent reverb on anything iOS has been lacking. Addictive offers the nicest, wide, long, rich reverb I’ve been craving since day one. Most are fair at best, and for good reason. Reverb takes a lot of power, so compromises have to made considering hardware limitations. I don’t know how VirSyn did it, but they managed to raise the bar on iOS reverb, that not only sounds really nice, but also can be run simultaneously with other FX as well, and still maintain stability. I’m not saying its the best reverb ever made. It is probably the best ever made for iOS. With a fully programmable 32 step arpeggiator sporting accent, tie, transposition, and note order, your most creative sequences are made with ease. Trigger notes or chords. This thing is a beast! It has a very handy loop recorder, a randomizer via virtual dice to have the synth create something totally ..well…random. Complete with full MIDI support, a smart user interface with virtual controls, touch screen specific integration of several features, and more. In fact. There’s so much more to Addictive Synth, listing everything would take pages and pages. Its hard to believe this is on a tablet. Please visit the VirSyn web page HERE for all the details and further descriptions of its very impressive spec list. In all, Addictive Synth is just that, Addictive. This is the synth I go to for complex sounds that morph, move, and come to life. From deep space pads, acid, leads, to percussive parts or anything in between. If you can imagine it, Addictive can do it. It’s never crashed on me, and the sound quality has never disappointed. AddictiveSynth has been a long time favorite of mine so seeing it updated to support Audiobus input really makes my day. Everything I stated about AddictiveSynth in my original review stands. With Audiobus support, it now falls seamlessly into any workflow. With improved Flanger FX, dozens of new presets, and polished midi capabilities; AddictiveSynth is better than ever. With the new FM oscillator configuration new patch making possibilities are further expanded beyond an already outstanding selection of excellent parameters. This is truly a golden synth for iOS. 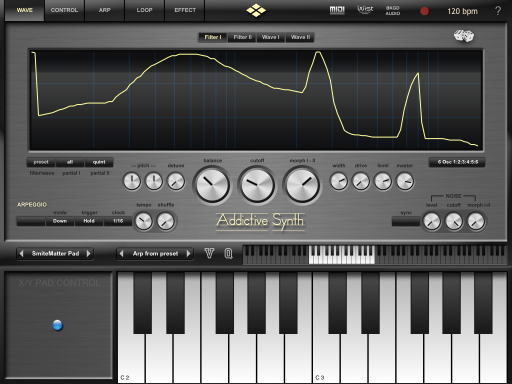 If you don’t have AddictiveSynth already, you should seriously consider picking it up now.